CONTAIN will promote the use of appropriate container security sensors providing monitoring and tracking data which will be fused with additional information sources in order to identify high-risk containers that should be more carefully monitored and investigated. To ensure adoption by stakeholders, the solutions must balance costs with benefits for the parties that adopt the necessary upgrading of their processes. 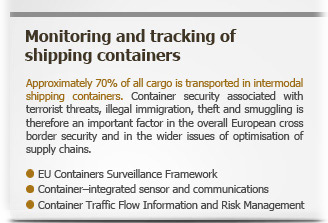 CONTAIN Decision Support Services that will exploit the extended container monitoring and tracking information to optimise container transport related processes both in terms of security performance and efficiency and quality of container transport services.